The river boat hums down the Thames. Lush green gardens and gabled houses line the riverbanks as we pootle down towards one of Britain's most desirable villages: Bray, in Royal County of Berkshire. Tudor mansions and neo-Gothic piles; if the digs aren't fabulous, their present and former owners make up for it, from Sir Michael Parkinson to Elton John's mum. 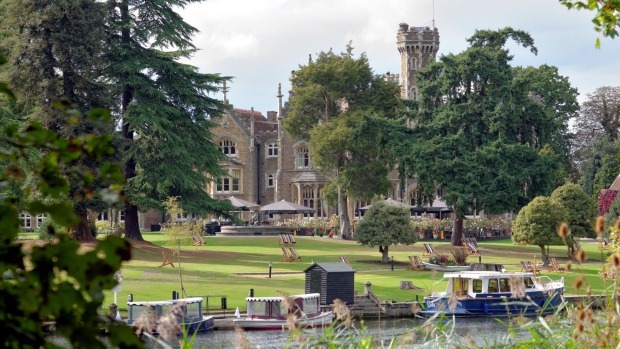 There are embassies of Far Eastern kingdoms and off-duty houses for foreign royalty (the queen, of course, lives in nearby Windsor) and you may spot residents from neighbouring villages, including Terry Wogan, Natalia Imbruglia or Michael Palin. Steve Harris, our captain and owner of the 34-foot Dutch motor yacht Fringilla, delights in blowing our mind with deliciously colourful real estate gossip: "There is no public money in Bray" and "Yes, £8 million for that one" as we cruise the ancient waterway. Our river journey starts at the ingloriously named Maidenhead Railway Bridge, designed by the gloriously named railway engineer Isambard Kingdom Brunel. Also known as the Sounding Arch, which sounds much better, the brick bridge was created by Brunel with what was, in 1838, the world's widest arches. Its two broad spans inspired Turner to paint it in 1844 and London-bound trains still thunder over the bridge today. The natural end to the two-hour cruise down this little elbow of the Thames is one of Bray's three-Michelin-starred restaurants, of which there are only four in Britain. There are two in the village of 5000: Michel Roux's Waterside Inn, which has a handy wharf out front, and Heston Blumenthal's The Fat Duck. Bray is determinedly a village. Not a town, not a civic centre but a bona fide parish, with hamlets and greens, as mentioned in the Domesday Book of 1086. There are crests galore atop the pubs, on private houses, through the picturesque graveyard of St Michael's Church, which looks like it's auditioning for Midsomer Murders. There's the sprawling red-brick Jesus Hospital, sporting a plaque that describes how the almshouse was founded in 1627 by a loaded London fishmonger who left it in trust to his guild, the Worshipful Company of Fishmongers. Bray was also home to Hammer Films, and its neighbour, a gargoyle-riddled Gothic folly, became Frank-N-Furter's mansion and hosted several zombie films. It's now the very nice Oakley Court Hotel, its car park exit sign reads a perky "Toodle pip!" We're in Wind in the Willows territory here. Then there's the Heston factor. Look, I know you can buy his ham pies and puddings in Coles now, but that doesn't detract from going back to the master's back yard. Heston owns three eateries in the village: The Crown – think pub grub of fine fish and designer salty chips; The Hinds Head – another 15th-century pub but more refined, dishing up hashes of snails; and the three-Michelin-star The Fat Duck. The world-acclaimed restaurant has just finished its successful sabbatical in Melbourne's Crown Towers hotel, though it won't reopen from its refit and antipodean sojourn until later this year. This wintry November eve we're checking into Lavender Cottage, the newest property by Malaysian group YTL Hotels.Its Malaysian properties, Pangkor Laut and Tanjong Jara Resort, do a mean line in super-luxury, so look past the doilies-and-fust misnomer because this little three-bedroom cottage sleeps six in top-of-the-line style. Listing its features reads like an interior design magazine: sounds by Bang & Olufsen, Peter Reed Egyptian cotton bed linen, Turkish carpets and a Gaggenau wine fridge. The massive food fridge is stocked with organic goods – cheeses, antipasto and wine – despite Bray's embarrassment of restaurant riches being a three-minute walk away. The cottage even offers to send a chef in to whip up brekkie. The bartender in the Hinds Head, across the road, sends a couple of cocktails, which are the perfect end to our arrival canapes of delicate smoked salmon and sandwiches, petit fours, perfect strawberries and pots of afternoon tea. Heston's own Early Grey gin is in the cupboard (and, I discover later, in the posh Waitrose supermarkets) and I have a passionate affair with butter churned with Anglesey sea salt from the Prince of Wales' own organic label, Duchy Foods. Lavender Cottage is painted a dove grey, with exposed red brick walls and a glass conservatory built onto the original 1600s building. A fire crackles in the fireplace, lighting great beams revealed and renewed after an ignominious 1980s renovation, slate floors are warmed underfoot, the bedrooms glow with ivory silks, and there is nothing wanting in the kitchen. In the garden, there's even a little greenhouse for spa treatments. If, for some bizarre reason, you find yourself in England in November, there is no finer cottage to call home. Its sister properties are flamboyant party house Bray House, the former stables of Manor House of Bray, built in the 1780s; and the tiny, beautiful, couples-only Dormer Cottage. Each is worth a night's stay purely to see the envy on day trippers' faces. We waltz in for lunch at one pub, have dinner at another, walk through tiny Tudor gatehouse, the 15th-century Lych Gate, to the mossy village graveyard and take a day trip to Windsor, to check out the locals. Later, I discover the M4 motorway roars just minutes away from Bray but the village pays no heed: it just continues with its mission to achieve professional cuteness. After two days of bucolic luxury, it takes but an hour to be jettisoned back into fever-pitch London. Sure, there's a king's ransom of beauty in the capital but it's tempered by rashes of high-street betting shops, dilapidated curry houses and grim public housing. If the capital has taken its toll on me, Bray is the ultimate antidote. Bray is 10 minutes from Maidenhead, three stops from Ealing Broadway, on the London Tube's Central and District lines. Alternatively, hire a car from Heathrow airport for the 27-kilometre journey to Bray. Take a two-hour cruise downriver on the Fringilla, a renovated 34-foot Dutch motor yacht. See boathiremaidenhead.co.uk. 3 ROYAL TOUR Go all-out royalist with a visit to the 900-year-old Windsor Castle's State Apartments and the tomb of Henry VIII and see the Changing of the Guard. 5 CLASS ACT Even princes have to go to school: take a tour of historic Eton College, which taught princes William and Harry their three Rs, and was the backdrop for the WWI epic Chariots of Fire.